Can Chiropractors Contribute to Work Disability Prevention Through Sickness Absence Management for Musculoskeletal Disorders? BACKGROUND: Despite extensive publication of clinical guidelines on how to manage musculoskeletal pain and back pain in particular, these efforts have not significantly translated into decreases in work disability due to musculoskeletal pain. Previous studies have indicated a potential for better outcomes by formalized, early referral to allied healthcare providers familiar with occupational health issues. Instances where allied healthcare providers of comparable professional characteristics, but with differing practice parameters, can highlight important social and organisational strategies useful for informing policy and practice. Currently, Norwegian chiropractors have legislated sickness certification rights, whereas their Danish and Swedish counterparts do not. Against the backdrop of legislative variation, we described, compared and contrasted the views and experiences of Scandinavian chiropractors engaging in work disability prevention and sickness absence management. METHODS: This study was embedded in a two-phased, sequential exploratory mixed-methods design. In a comparative qualitative case study design, we explored the experience of chiropractors regarding sickness absence management drawn from face-to-face, semi-structured interviews. We subsequently coded and thematically restructured their experiences and perceptions. RESULTS: Twelve interviews were conducted. Thematically, chiropractors’ capacity to support patients in sickness absence management revolved around four key issues: issues of legislation and politics; the rationale for being a sickness absence management partner; whether an integrated sickness absence management pathway existed/could be created; and finally, the barriers to service provision for sickness absence management. BACKGROUND: Musculoskeletal pain is a major cause of work disability. Many patients with musculoskeletal pain seek care from health care providers other than their general practitioners, including a range of musculoskeletal practitioners. Therefore, these musculoskeletal practitioners may play a key role by engaging in sickness absence management and work disability prevention. This study aimed to determine the prevalence of musculoskeletal practitioners’ practice behaviours, and their perceptions and beliefs about sickness absence management by using Scandinavian chiropractors as an example, as well as to examine the association between these characteristics and two different practice behaviours. METHODS: As part of a mixed-methods study, we surveyed members of the national chiropractic associations in Denmark, Norway, and Sweden in 2016. Descriptive statistics were used to describe prevalence. Multilevel logistic regression with backwards stepping was used to estimate odds ratios with 95% confidence intervals between each of the two practice behaviours and the characteristics. RESULTS: Out of the 802 respondents (response rate 56%), 372 were Danish, 349 Norwegian, and 81 Swedish. In Denmark and Norway, 38.7 and 37.8% always/often considered if sick leave was appropriate for their patient compared to 21.0% in Sweden (p = 0.007); and 86.5% of the Norwegian chiropractors always/often recommended to return-to-work versus 64.5 and 66.7% in Denmark and Sweden respectively (p < 0.001). In the final models, factors associated with the two practice behaviours were age, level of clinical experience, working as a teacher, the tendency to be updated on current legislations and policies using social services, contact with general practitioners, relevance of engagement in SAM, consideration of workplace factors, SAM as part of the clinical tool box, patient out-of-pocket fee, and recommending fast return-to-work. Purpose To assess the impact of workplace-based return-to-work (RTW) Coordinators’ interpersonal and functional activities on RTW outcomes. Methods Multivariable logistic regression analyses of cross-sectional and longitudinal survey responses of 632 injured workers with at least 10 days of work absence in Victoria, Australia, adjusting for demographic and other workplace factors. Outcome was being back at work for at least 1 month, measured at both baseline and 6 month follow-up survey. Participant responses to stressfulness of Coordinator interactions were dichotomised into good and poor and evaluated as a proxy for Coordinators’ interpersonal activities, while having a RTW plan was evaluated as a proxy for functional activities. Results At baseline, RTW plans doubled the odds of RTW (OR 2.02; 95% CI 1.40-2.90) and attenuated the impact of good Coordinator interactions (1.14; 0.77-1.70). At 6-month follow-up, the opposite was observed: good interactions nearly doubled odds of RTW (1.90; 1.22-2.95) while RTW plans were non-significant (1.02; 0.68-1.54). BACKGROUND: Work disability is a major personal, financial and public health burden. Predicting future work success is a major focus of research. OBJECTIVES: To identify common prognostic factors for return-to-work across different health and injury conditions and to describe their association with return-to-work outcomes. METHODS: Medline, Embase, PsychINFO, Cinahl, and Cochrane Database of Systematic Reviews and the grey literature were searched from January 1, 2004 to September 1, 2013. 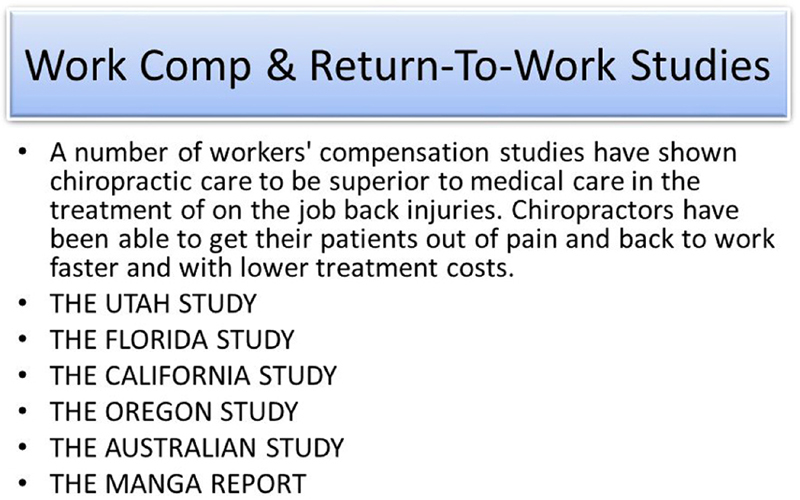 Systematic reviews addressing return-to-work in various conditions and injuries were selected. Eligible studies were critically appraised using the Scottish Intercollegiate Guidelines Network criteria to identify low risk of bias reviews. RESULTS: Of the 36,193 titles screened and the 94 eligible studies reviewed, 56 systematic reviews were accepted as low risk of bias. 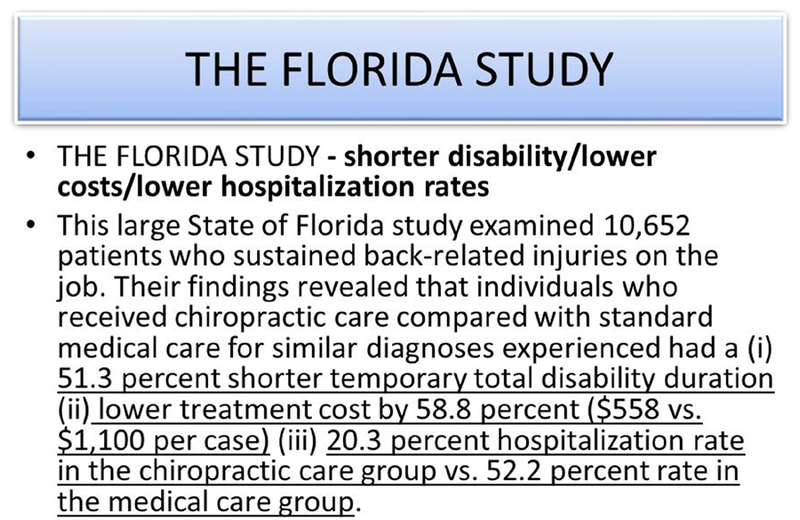 Over half of these focused on musculoskeletal disorders, which were primarily spine related (e.g., neck and low back pain). The other half of studies assessed workers with mental health or cardiovascular conditions, stroke, cancer, multiple sclerosis or other non-specified health conditions. Many factors have been assessed, but few consistently across conditions. Common factors associated with positive return-to-work outcomes were higher education and socioeconomic status, higher self-efficacy and optimistic expectations for recovery and return-to-work, lower severity of the injury/illness, return-to-work coordination, and multidisciplinary interventions that include the workplace and stakeholders. Common factors associated with negative return-to-work outcomes were older age, being female, higher pain or disability, depression, higher physical work demands, previous sick leave and unemployment, and activity limitations.